Add next steps to your one-on-one and team meeting agenda items so that action items get completed and nothing falls through the cracks. 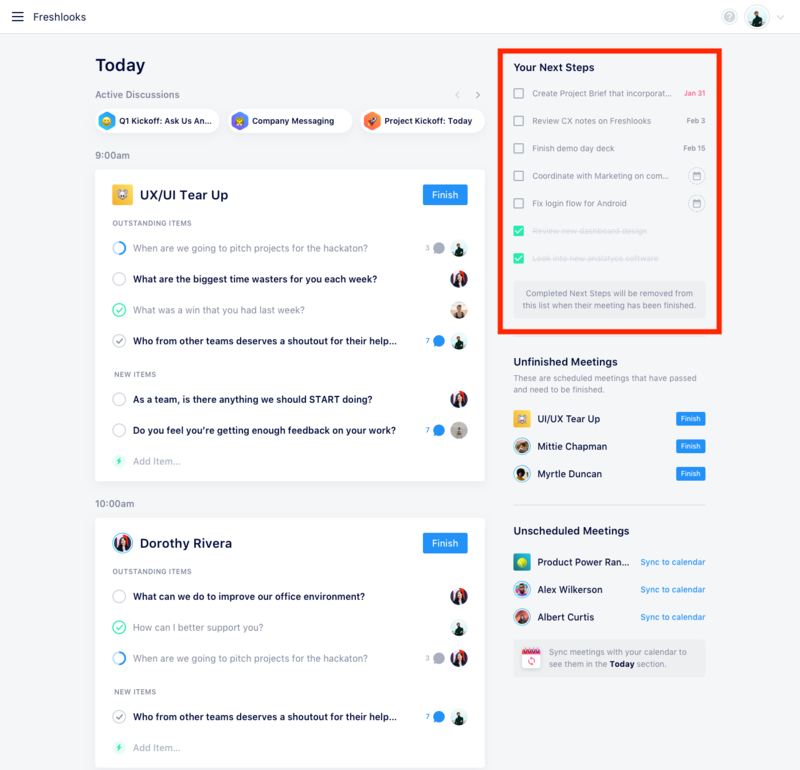 You can create next steps on SoapBox and add them to any of your agenda items. Setting a due date and assignee to a Next Step helps you and your team take accountability for the things that need to get done and ensure that nothing falls through the cracks! All next steps that are assigned to you will appear on your Today page in the top right hand corner, they'll be listed and prioritized by due date. To add a next step, click on your agenda item to open it, then click “Next Steps”. Type your next step and hit enter to add it to the item. Then, add a due date by clicking “Set Due Date” and/or assign the next step to a meeting member by clicking the avatar symbol next to the due date. Note 📝: You can only assign next steps to members who are a part of that meeting. If there are outstanding next steps on an item, that item’s progress loop will be shown as incomplete and you won't be able to check it off your agenda. Once you’ve completed the next step, check it off either from the item view or from the Next Steps widget on your Today page. If you check off a next step from your Today page, it will stay there until the meeting has been closed, but will be moved to the bottom of the list. Once all your next steps are completed, the progress circle will fill in and your item will close. Note 📝: You can uncheck a completed Next Step up until the meeting is closed.